Used antenna switch assembly in good working condition. Center climate control unit. For 1991-1997 with AUTOMATIC climate control only. Also fits 1996-1997 Lexus LX450. This controls the heater, A/C, Blower and all associated parts. Nice headlight leveling switch found in the Euro spec 80 series. Give your truck a little Euro function with this great switch. 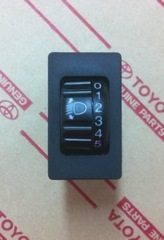 This is the Front Right Power Window Switch for the 1991-1997 FJ80. Used hazard switch in good working condition. Headlight, headlamp adjusting switch. Fits 91-97 with adjustable front headlights. This is the control switch that aims your headlight up or down. Non USA European models. Headlight washer switch assembly. Fits years 95-97 European specification or modified headlights. Used good working master power window switch. Fits all 1990-1997 80 Series Left hand drive. Used RS3000 status update unit in good working condition. Used transfer indicator switch in good working condition. The is the no. 1, 3, and 4, all are the same. Used transfer switch indicator switch no. 2 in good working condition.